Jamie Carragher once claimed that fullbacks are either “failed centre-backs or failed wingers” and to some extent, he is correct. Often described as the least glamorous position in football, fullbacks tend to go unnoticed when their team is playing well. Think of Dani Carvajal in Real Madrid’s Champions League winning XI or Lucas Hernandez in the French team that won the 2018 World Cup. The energetic left-back, who was a national athletics champion as a child, has taken the Championship by storm this season. Lewis only broke into the Norwich first team during the latter half of the 17/18 campaign, so it’s astounding to see how well he’s slotted into a team chasing promotion. He announced his breakthrough to the first team with a fantastic performance against Chelsea in the 3rd round of the FA Cup which included a last-minute equaliser. The 21-year-old has also had international recognition, choosing Northern Ireland over England, and making his senior debut for them in March 2018. With Chris Brunt retiring from international football in the summer, Lewis could on the left flank for years to come. Lewis has improved remarkably under Farke, and plays a crucial role in Norwich’s team. A product of Luton Town’s youth academy, Max Aarons made the switch to East Anglia as a schoolboy. Aarons only made his senior debut for Norwich at the start of this season, but has already received several plaudits for his impressive performances. The right-back has to be considered for the “Championship Young Player of the Season Award”, as he’s adapted to senior football with relative ease. He bombs up the right wing for Norwich, giving the Canaries width in attack and overloading opposition defences. The Londoner has been called up to the England u19 squad following his breakthrough season, and will be eager to climb up the English National Team ladder. Aarons has contributed with 2 goals and 4 assists this season, and has unsurprisingly been looked at by Premier League juggernauts. Just like Jamal Lewis, Aarons has been a revelation under Farke, and has established himself as one of the hottest prospects in the Championship. Norwich’s two breakout stars would give hope to any young footballer. In just a matter of months, Jamal Lewis and Max Aarons have made the leap from academy football to the Championship, and certainly haven’t looked back. I’m sure that both will be playing Premier League football very shortly, with or without Norwich. Lewis looks like he’ll be a starter for Northern Ireland for years to come, while Aarons has the slightly harder task of breaking into an England side that has a multitude of quality right-backs. 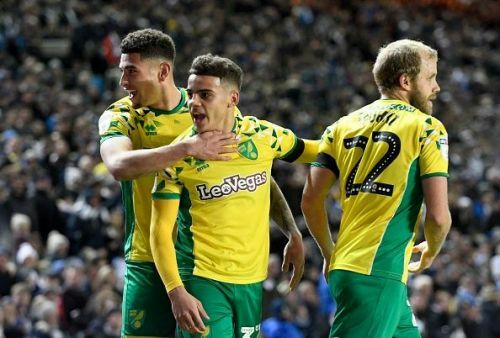 The pair, alongside the whole Norwich team, have been a treat to watch this season, and are just another example of young players being made in the Championship.